Rumors about the Verizon iPhone are heating up while many blogs are reporting that Skype will bring video calling on Verizon’s iPhone. There were some posts on Skype.com that hinted at the possibility of this fact. 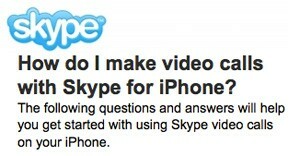 Skype also posted some details about how to use video calls over iPhone 4 using Skype. The document says that you need an iPhone version 3.0 to make Skype video calling work. Skype is on a 2.1.2 version for the iPhone. iPhone 4 or 3GS and also iPod Touch are supported. iPad can only recieve video and not send video as iPad does not have cameras but that might soon change when iPad 2 comes along. Skype also requires the iOS 4 but it isn’t clear when it will be launched. The leaked documents hint at it being launched during a Verizon iPhone event in the new year. The following is what the document said. How do I make video calls with Skype for iPhone? The following questions and answers will help you get started with using Skype video calls on your iPhone. To make video calls with your contacts, you will need an iPhone 4, iPhone 3GS, 3rd generation iPod touch, 4th generation iPod touch or an iPad. Your contacts will only be able to see you if your device has a camera. Make sure your device is running iOS 4.0 or above and that you are using Skype for iPhone 3.0 or above. You can make Skype video calls by using a WiFi or 3G connection*. The quality of the video will depend upon the available network conditions. *Additional data charges may apply. Check with your operator for details. If you have an iPhone or iPod touch with two cameras – front and rear – you will be able to switch between them during a Skype video call. If you have an iPhone 3GS it will always use the rear camera. If you turn your device into landscape mode, the camera picture will automatically rotate. In both portrait and landscape mode double tapping anywhere on your screen will zoom the picture to take up the full extent of the screen. Double tapping again will take the picture back to its normal size. While on a Skype video call the sound will always be played through the loudspeaker, unless a headset is plugged into the device.